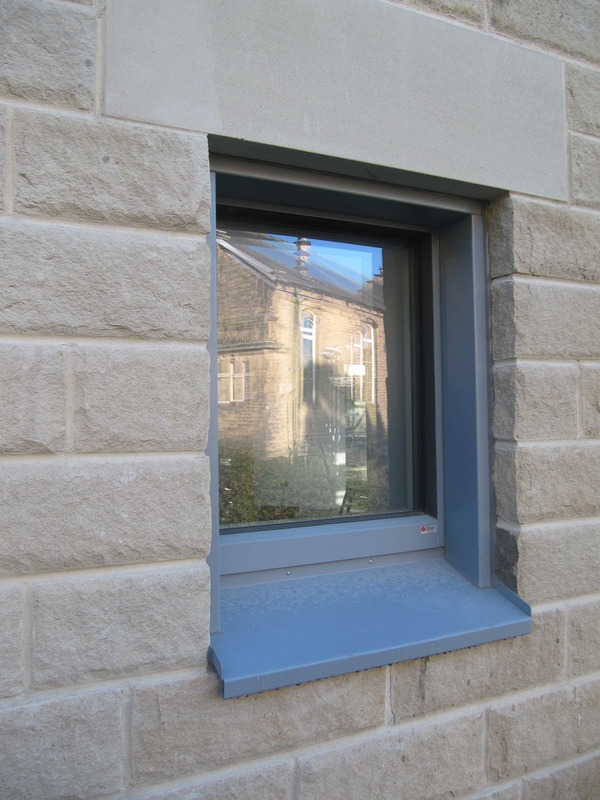 In this blog we are looking at aspects of the Golcar build that are different to those of our previous cavity wall Passivhaus at Denby Dale. For this reason we haven’t covered topics such as detailing for intermediate floors, which were exactly the same as at Denby Dale. However our approach to the MVHR systems and heating has been different, drawing on the lessons learnt from Denby Dale. 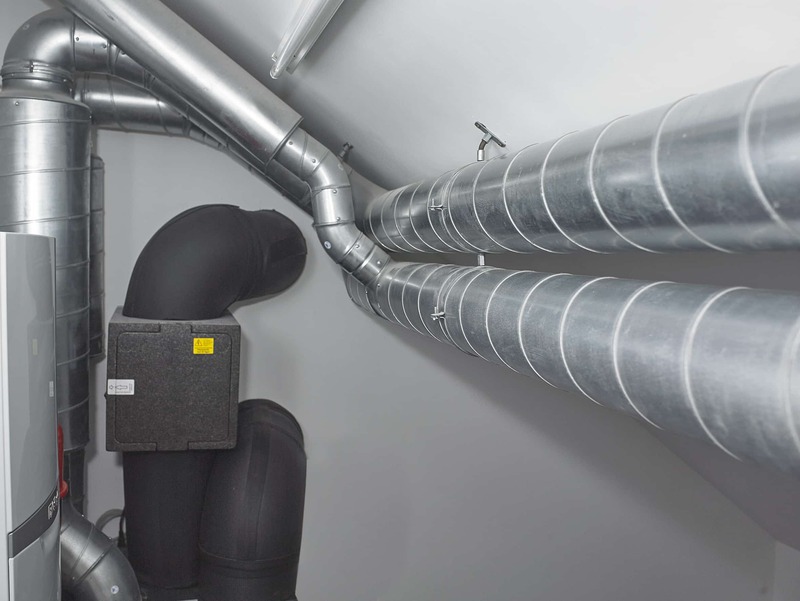 At Denby Dale the heating and MVHR systems were connected through the use of a duct heater on the supply air, heating up the air coming into the building. However we found that this was quite difficult to control so at Golcar we decided to simplify things by separating the functioning of the MVHR system and heating system completely. 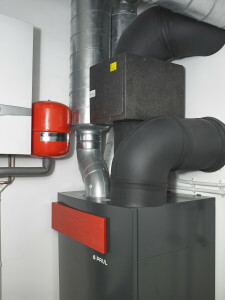 The central heating boiler and MVHR unit are both located in the upstairs plant room but work completely independently. As at Denby Dale, we are using a Vaillant EcoTec gas boiler at the Golcar project but have developed a very different heating system design. At Denby Dale we had a very small amount of (water) volume in the central heating system (just one radiator and 2 towel rails) which caused quite a lot of problems in the first year with the boiler ‘cycling’ and switching itself on and off repeatedly and causing overheating. At Golcar we are getting around this problem by creating a thermal store or ‘buffer tank’ (also located in the plant room) which adds volume to the system (which would otherwise be too small as there are only two small radiators and three towel radiators in the whole building). In addition the thermal store will be heated by the house’s solar thermal panels and will also supply the hot water. The boiler will heat the thermal store to a certain temperature which will only lose its heat slowly. If the room temperature thermostats drop the radiators and towel rails in the system will take water from the thermal store. The boiler is only asked to go on when the thermal store itself has dropped to a preset temperature. This system then avoids the boiler ‘cycling’ and turning on and off too frequently as it did at Denby Dale. It can take a long time to sort out any heating issues in a Passivhaus. We have found with all three of our projects that, because of the ‘cave like’ effect of Passivhaus buildings, it can take a long time for them to warm up and cool down. It can be quite difficult to try to fine balance a system because the response time of the building is so slow. This can makes it hard to monitor, leading to delays in trying to address the problem. We’re hoping our solution at Golcar will make things simpler this time around. In terms of MVHR systems and design, we are using the PAUL Novus 300 system with rigid steel ducting again. Most of the ducting is concealed but a small proportion is visible in one of the hallways. It has been a straightforward project, very well designed by the MVHR team and installed by the GBC building team. With the scaffolding down now, the PROGRESSION windows and doors at the project are looking great and we have had much positive feedback at the Passivhaus open days. The cavity closers we have developed for the project look good too and offer a neater solution than those we used at Denby Dale. 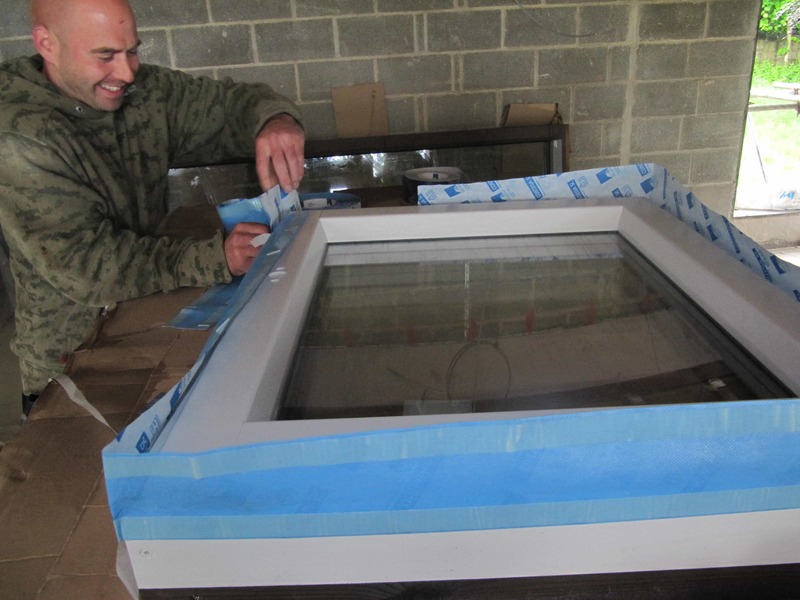 The first airtightness test at Golcar came in at 0.26 ach @ 50 Pa – our best airtightness result yet. 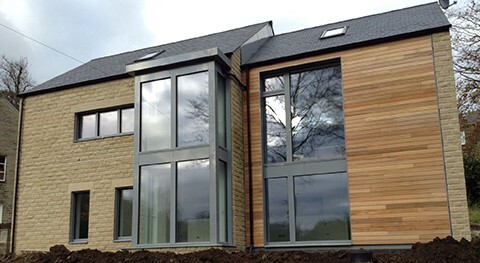 The results for previous projects were Denby Dale (0.33 ach @ 50 Pa) and Stirley Farm EnerPHit (0.36 ach @ 50 Pa). We’re really pleased with the result, which shows that the building team have now got Passivhaus completely under their skin. I’m sure I’ve had to visit Golcar far less than any of our other projects, even though it’s only a mile from the office. The reason that I didn’t need to visit so often was that I had complete confidence that they’ve got it and not only have they got but they’ve got it better than I have! For example the building team were trying out some taping methods, which I questioned but they knew were going to work . One of the things we did on this job was to separate the taping procedure from the plastering trade so we stuck tape to block work using Contega SL instead of plastering it in with Contega FC, as we did at Denby Dale. This meant that when the plastering team arrived airtightness wasn’t an issue, they could just concentrate on doing a good job. For me the biggest lesson on our journey of building Denby Dale, Stirley Barn and now Golcar is the positive learning process for our building team. This has resulted in a level of competence that allows the design process to be less intense and subsequently cheaper. This lesson could/should be applied to the construction industry as a whole. Passivhaus levels of build quality can be achieved in a relatively short period given the correct levels of technical and economic resources, and respect for existing experience. Far better building practices are achievable for the UK construction industry, willingness is the key. The project is now in final stages of construction, completing internal fixings etc. The next and final blog will cover Passivhaus certification and a final wrap up of the project, with some images of the finished project. Congratulations Bill to you and your team on a great build and an exceptional air tightness result. Just a couple of queries, what heating strategy would you adopt where there is no mains gas? Do the latest Paul MVHR units allow wireless remote control from an iPad or iPhone? Thank you Phil. Is it heresy to say LPG for heating and cooking with solar thermal for hot water, and a log burner for back up? Of course it comes down to the client, but heat pumps are very expensive to install considering the need of a Passivhaus. The Golcar house has a heating requirement of only 2Kw or so when -10C outside and a LPG wet heating system is relatively cheap to install and maintain. An alternative is ‘all electric’ with an in-line duct heater in the ventilation system. However with electric power being penalised by a multiple of 2.6 due to its ‘dirtiness’ in PHPP calculations, a Primary Energy limit of 120KWh/sqm/yr can easily be over shot. And, there is the wider issue of extra demand on fossil fueled power stations…………. Ps, I am not aware of Paul having remote controls yet. I find a number of clients prefer to look ahead to heat pump solution, others want simple low cost LPG. The latter are now generally on 2x47kg cylinders, which is rent/standing charge free, and economical for modest PH (5-6 cylinders/year), use PV and immersun for reliable and cheap solar hot water, and most don’t have wood burner – not necessary and expensive to install. It was interesting how when talking for the PassivHaus Trust in Edinburgh this week we were asked about ‘off gas grid’ heating. There were open mouths around the room when we suggested LPG. People are seduced by heat pumps! PVs with immersion for hot water rather than solar thermal? Is that sensible for the UK? I know it can be argued in certain parts of the US. Using PV for hot water. For a long time I’ve questioned this approach. Times are changing however. Though I’ve not done the calcs the cost per kWh for PV has fallen significantly in recent years. As strange as it may sound using PV to heat water could begin to make sense if not right now then sometime soon. (Of course with the RHI you get paid to use the energy so this makes it all the more ‘affordable’) …..personally and professionally I’m not a fan of the RHI as it has a tendency to encourage poor decision making, but clients tend to like it. Overall given how hard it is to control heating when you have a large thermal mass and a low heat lose, I question if timber frame with a low thermal mass would be easier to control the heating for. Apologies for taking so long to reply. I hadn’t looked into fan assisted radiators, it may well be an answer. How aesthetically pleasing they are is up for debate, and of course it is another piece of equipment to maintain! Whether heating is easier to control in a timber frame Passivhaus as opposed to heavy weight masonry construction, I would say it is not a significant issue. Once a heating system is set up correctly there shouldn’t be a problem with any form of construction. It took us a year to trace a fault in the signalling to a remote room stat/programmer at our Stirley Barn project and that is a timber frame construction. The heating is needed so little in a Passivhaus it takes a long time to find out whether a system is functioning at optimum efficiency and to the occupants’ needs. Your comparison of heating approached between Denby Dale and Golcar is really useful. If I understood you correctly, at Denby Dale you had a 4kW gas boiler heating a circuit that comprised a duct heater plus a couple of towel/regular radiators. Which equated to a relatively small volume and therefore you had issues with the boiler cycling. Hence your use of a thermal store in Glocar which I assume you ran a similar sort of circuit (duct heater + some rads) off the store but the crucial point is the boiler is not heating the circuit but instead the large volume thermal store and hence resolving the cycling problems. We are currently planning a project and have a similar choice to make. I like the idea of a gas boiler + thermal store but indications are that its going to be significantly more expensive than a regular unvented cylinder and a boiler directly heating a central heater type circuit. In addition it seems that thermal stores are still relatively rare and most engineers dont seem comfortable/experienced with them. c) any recommendation regarding which Thermal Store you went for and if you were pleased with it? a) Hmm. It depends on the size of house. For a smaller more modest property a thermal store could well take up too much space, be too expensive, and contribute too highly to incidental gains. An off the shelf small combination boiler with enough radiators to give a low enough return temperature to stop cycling is relatively cheap to install and easy to maintain. With a larger house such as Golcar with three en suites etc, I think we have made the right choice in having a thermal store. I am concerned, due to client preference, that we do not have enough radiator capacity (although it is 21C today) at present, but it will be relatively easy to add more if needed. b)We got around the the cycling issue at Denby Dale by adding the appropriate weather compensator system. This allowed the boiler to modulate down even further to around a 3Kw output. The clients have also learnt not to expect instant heat, a Passivhaus takes longer to respond to commands particularly with a small heating system. c) The thermal store at Golcar is a purpose made 250 litre copper cylinder, 1500/500mm, C/W solar coil and direct tappings, 100mm lagging. We obtained from our friends at Eco Heat and Power Ltd, Hebden Bridge. The house is not occupied yet, so I cannot give you a definitive answer on its performance. I have not commented on this blog before although I know both Phil and Mark. Green Building Store designed, supplied and commissioned our Paul Novus 300 system. Our system is based on a VEAB 160-3-2.5 CCW Post Heater on one zone and 3 radiators and 4 towel rails on a second zone. In hindsight I would have split the towel rails from the radiators On a separate zone. Both zones are fed from a 500l Akvaterm Thermal Storue along with the DHW. The bedroom temperature is regulated by the post heater at 18C and the living spaces by the radiators at 20C. It is not possible to control the heat for the whole house with the post heater as we like lower temperatures in the bedrooms than the living areas. Having said that we have, as an experiment, run just the post heater for 8hrs when the outside temperature was -6C and raised the whole house temperature to 22C. However, the radiators and towel rails are also useful in raising the core thermal mass temperature much more quickly than the post heater ever could do! The house is a timber frame construction with a concrete floor providing the thermal mass. The thermal store is heated by via two 3kW immersions powered soley from the 6kW solar PV array (not Mark’s preferred method…..) and a 14kW ecotec Vaillant boiler for days when solar PV is inadequate. Because of the size of the thermal store and the set temperature differential the boiler never continuously cycles. Had we not had mains gas then I would have installed an air source heat pump powered primarily from the Solar PV and not used immersion heaters. The main demand for heat from the Thermal store is for DHW of course and not space heating. A summary of the overall design is on the Project Database.